Cheap Talk 4 now scans! Allows the use of single or dual switch scanning. A light illuminates sequentially above each message square. This versatile unit also allows direct activation by pressing the squares or 1 to 4 external switches. Features scan modes, with a choice of eight different scanning options, including audible scan. The scanning speed is adjustable to accommodate a wide range of abilities. This Cheap Talk has 12 levels. The total recording time is 288 seconds or 6 seconds per message. (48 messages total). 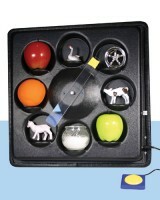 Assists in language development and it's easy to use! 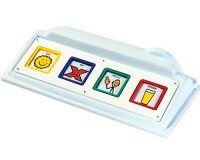 Our popular Cheap Talk communicators are light-weight, portable, user-friendly and economical. They enable the user to “speak” pre-recorded messages. Use them to provide communication and cognitive support to enhance and develop expressive and receptive language skills. Messages can be up to 5 seconds each and can be recorded and re-recorded as often as you wish. 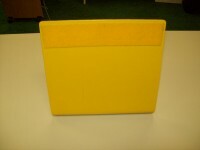 Encourages face-to-face communication! This popular, transparent-faced clock communicator makes it easy for teacher and student to view one another. The student can communicate by activating a switch which moves the clock hand to the desired picture, word, or object affixed to the clock face. You can customize the communication by using as few (or as many) objects as you’d like. 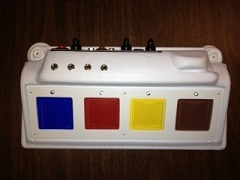 Single or double switch capability available: one switch moves the hand clockwise; the other moves it counterclockwise. Clock speed is simple to adjust. 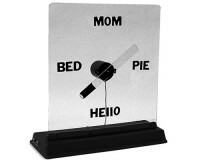 Ingenious clock helps communicate thoughts! Your switch activation moves the clock hand to the desired picture or word affixed to the clock face. You can customize the communication by using as few or as many objects as you'd like! Clock speed is easily adjustable. Specially designed for the visually impaired! 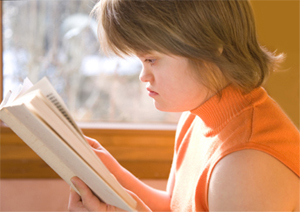 Ideal for children or adults with impaired vision. This affordable clock communicator has eight compartments to hold items. When the external capability switch is activated, the clock hand moves to the desired picture, word or object affixed to the clock face. Single or double switch capability available. When 2 switches are being used, one turns the clock hand clockwise while the other will bring it counter-clockwise. Clock speed is easily adjustable. 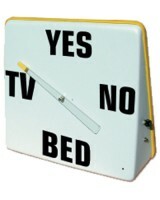 Offers 60 square inches of communication! This communicator has four 3" x 5" plate switches providing a large target area for individuals who cannot easily access smaller communication devices. Light pressure on each plate sounds a message of up to five seconds. Messages can be recorded and re-recorded as often as you wish. This versatile communicator can be positioned at a 30 degree angle or a 70 degree angle. The communicator also allows the user to simultaneously communicate and activate four different toys or devices with the four cords provided. Go Talk 9 Plus is a lightweight and portable assistive technology device designed for young children or for someone with more limited mobility. This sturdy, new communication aid has a 45 message capacity and five recording levels. There are three "core messages" displayed at the top of the board which remain the same on each level, eliminating the need for re-recording on every card. Go Talk 9 Plus provides great sound quality and easy volume control. Recording is simple with the sequential recording key, built-in overlay storage, and easy erase features. This device is to help individuals express there thoughts. You can create as many words or pictures that you would want the individual to learn or use. Once you have the pictures you can Velcro them onto the board so that the individual can learn or express how they feel. Great visual learning tool! This talking device allows the user to visualize the formation of his/her words. It stores up to 20 seconds of speech and allows you to record four 5 second messages. Simply touch the plate switch to activate your pre-recorded message and begin training. 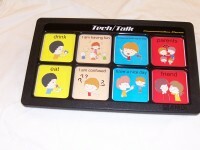 This device is a great tool for Speech/Language Pathologists! Facilitates communication! These compact visual message communicators allow for simple communication and come with built-in icon holders. 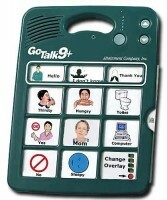 The Talkable II allows the user to record two messages. 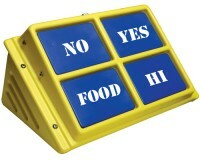 Choose between two activities such as asking and answering questions (e.g. yes, no). It has 10 seconds of recording time on each side and has output jacks to activate two devices. The Talkable III allows for three 5-second messages. Three jacks allow you to simultaneously activate a toy or device for immediate reinforcement. The Talkable IV allows for four 5-second messages with four jacks to operate devices. The 12-Level Talkable IV allows for four 5-second messages on 12 levels for a total of 240 seconds of record time. All the Talkables come with free clear covers. 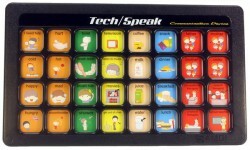 The Tech Speak 32 is lightweight, portable, multi-level augmentative and alternative communication device with 32 cells and up to 12 levels for up to 384 independent messages. It is designed to aid communication through direct selection. 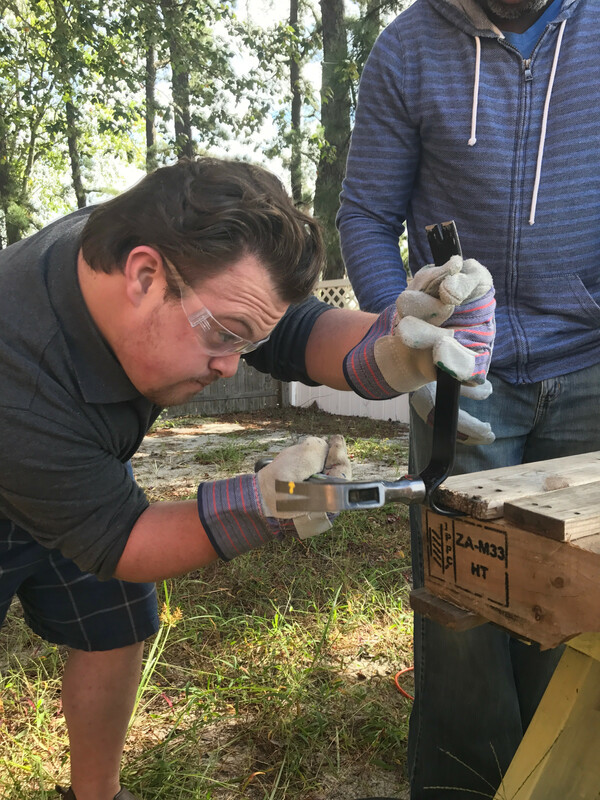 It is user-friendly and easy-to-use, while also being durable and rugged. 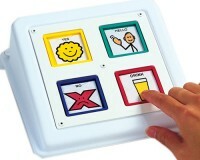 The TECH/TALK 8 is a multi-level augmentative communicator to offer high quality, reliable performance. 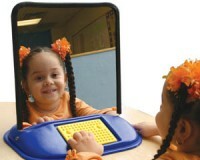 The Tech/Talk 8 augmentative communicator is a self-contained 6, 8 or 12 level communication device, which permits the user to record and playback 48 to 96 distinct messages, each of 4.5 seconds in length (9 seconds for extended time models). The Tech/Talk 8 is simple to operate, just turn the unit on, adjust the volume, select the desired level and push the pictures to activate the corresponding messages.